NTT DATA MSE Corporation will be showcased as "Proposal of a use case for a drive using Miracast technology" at NTT DATA MSE's booth during the GENIVI All Member Meeting & Open Community days to be held in Birmingham, UK starting on May 9th, 2017. 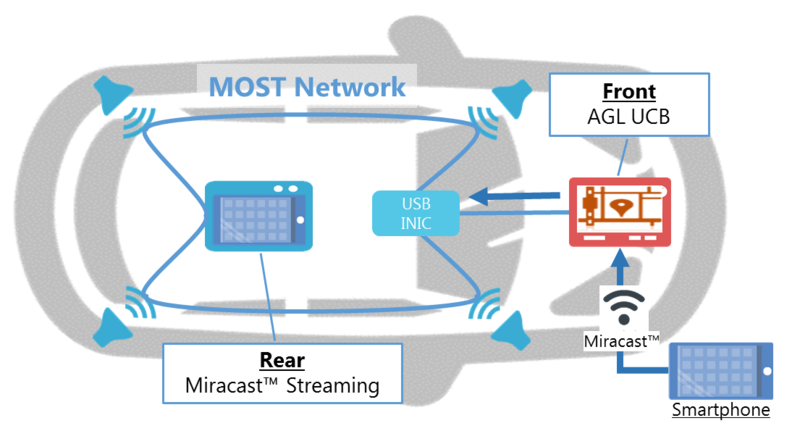 It is a demonstration that connects smartphone and IVI by implementing Miracast™ onto AGL UCB provided by Automotive Grade Linux. The video and audio are streaming from a smartphone via Miracast and played on rear display through the MOST network. NTT DATA MSE will provide a service that a driver can get the drive information and passengers can get the entertainment. We will demonstrate a new use case using Miracast™ technology. Fig. Overview of "Proposal of a use case for a drive using Miracast technology"
Currently, we are building a system that functions on Linux based open software stack. From now on, we will consider constructing a system using the GENIVI Development Platform, and we will continue our activities towards the implementation of the connectivity function that is our strength. GENIVI® Alliance is a trade association established mainly by automobile manufacturers, IT companies, automobile parts manufacturers, etc. It is an organization that develops specifications for open source software for automobiles and proposes it to the industry. GENIVI Development Platform is a platform developed by GENIVI. Miracast™ is a display transmission technology based on Peer-to-Peer wireless communication established by the Wi-Fi Alliance. Automotive Grade Linux is a Linux Foundation collaboration project, an open source collaborative development project to promote the development and introduction of full open software stack for connected cars. AGL UCB is a full open software stack for connected cars provided by the AGL project. MOST® is an abbreviation of "Media Oriented Systems Transport" and is a computer network standard designed to connect multimedia devices (such as displays and speakers) in a car. * "Linux Foundation" is a registered trademark of The Linux Foundation. "Linux" is a registered trademark of Linus Torvalds. * "GENIVI" is a trademark of Genivi Alliance. * "Wi-Fi","Miracast™" are registered trademarks of Wi-Fi Alliance. * "Android" is trademarks or registered trademarks of Google Inc.
* "MOST®" is registered trademarks of Microchip Technology Incorporated in the U.S.A. and other countries. * All other trademarks used herein are the property of each company.